WASHINGTON – Hot education topics ranging from workforce relevance and measuring student outcomes to school choice and postsecondary access and affordability highlighted the second annual Reagan Institute Summit on Education (RISE) conference Thursday at the Ronald Reagan Building & International Trade Center. Hosted by the Ronald Reagan Presidential Foundation and Institute, the gathering brought together 350 leaders in education, government, business, technology and philanthropy around the theme, “Education: A National Priority, a State Responsibility,” reflecting the governing philosophy of the 40th U.S. president for which it is named. In a panel discussion about what lies on the horizon for higher education, speakers noted a range of issues, including flexibility, transparency, innovation, more state control and a playing field that doesn’t favor traditional colleges and baccalaureate degrees over other forms of post-secondary education. The point of higher education “is to prepare not just traditional students for the future, but higher education today is a lifelong endeavor” that should be reflected in policies that provide all types of students various pathways to postsecondary education, said U.S. Rep. Jim Banks. The term college should be dropped in favor of a broader descriptor such as “post-secondary education” to eliminate a long-standing focus on and bias in favor of traditional universities, suggested Diane Jones, the education department’s principal deputy undersecretary. Traditional college isn’t the only or necessarily best option after high school, depending on a student’s goals and needs, she said. She and other panelists said different avenues, and the students who take them, should be equally respected. Kenzie offers an income-share agreement to make education affordable to a wider range of students, a newer method of reducing costs of higher education that other panelists said should be considered by more higher education institutions. The method makes a school “hyper-incentivized” to ensure student success in school and in the workforce, Ooi said, since the school gains a percentage of the student’s income for a period of time only if the graduate earns above a certain baseline. He and other panelists recommended that postsecondary schools pay more attention to the needs of so-called nontraditional students, who are projected to comprise the majority of college students in coming years. Also called “new traditional” or “neo-traditional” students, they need the community aspect of school. But an inability to fully partake in campus life because of family, work and other personal considerations can leave them feeling ostracized as students, said Diana Chen, a student at Arizona State University. Jones said schools must make efforts to integrate them, noting that students can be nontraditional in a range of ways that present different needs. “There’s a need to help adult learners know how to shop for a college, what relevant amenities to look for,” she said. U.S. Rep. Dr. Virginia Foxx echoed those views in a discussion about issues that prevent the American workforce from thriving. She also said that most postsecondary institutions have failed to “come to grips” with and keep up with rapid changes in the economy and workforce. During lunch, U.S. Secretary of Education Betsy DeVos and Sen. Ted Cruz discussed advances in legislative efforts to offer school choice in a conversation moderated by Center for Advancing Opportunity executive director Gerard Robinson. 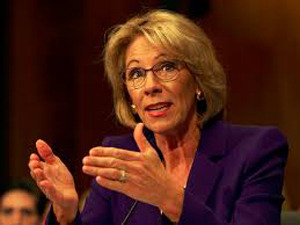 “We’ve really encouraged people to think broadly about what choice can mean,” said DeVos, describing the Education Freedom Scholarships and Opportunity Act introduced by Cruz in the Senate in February, with a complementary bill introduced in the House by Rep. Bradley Byrne. Their legislation would give a federal tax credit to businesses and individuals that donate to nonprofit scholarship funds in efforts to expand elementary, secondary and vocational education opportunities for students. Participation in the program is optional for states and has no federal mandate, and supporters say it is another way of improving education leading into college and workforce preparedness. “We need to think very broadly about what it could mean for every kid in the state to be able to find the right fit for them and their future,” said DeVos. In another step that advanced school choice, Cruz authored a narrowly successful amendment to the Tax Cuts and Jobs Act of 2017. It expanded 529 College Savings Plans to include K-12 elementary and secondary school tuition for public, private and religious schools and K-12 educational expenses for homeschool students. And it is among legislative actions designed to open the floodgates for “a torrent” of financial resources to flow to public, private and religious schools, with no money being diverted from public schools but opportunities for them to receive additional funds, Cruz said. States can pass legislation that amplifies the law’s effects, Cruz added, but some have moved to enact statutes that penalize taxpayers who take advantage of the benefit. He cited the opposition of teachers unions – and many lawmakers’ fears of defying them – as stubborn barriers to expanding educational options. Although research indicates high support in some Black and Hispanic communities for school choice – communities that suffer from academic achievement gaps at every level of formal education – those parents need to more strongly assert their views, Cruz said.